When America was a young nation, it looked to Europe for its fine arts and a person pursuing a career in painting went there to study. In the eighteenth century, Benjamin West studied in Italy, settled in London, and became the president of the Royal Academy of Art. In the nineteenth century, artist James Whistler also worked in England. Lengthy stays in Europe became almost a rite of passage in the twentieth century as American artists sought to absorb European culture and become part of revolutionary developments. When poet and art collector, Gertrude Stein was asked why she left Oakland, California, she said, “Because there was no there, there.” The hub of activity in the arts was Paris. In addition to studying art, there were other factors that would lead a person to Paris. Opportunities for women and people of color in the arts were limited in America. Mary Cassatt went to Paris in the nineteenth century and remained there for a successful career. Henry Tanner, an African American, also made Paris his home. Nicodemus, a ruler and a Pharisee, came to learn more about Jesus’ message. We see him as a white-bearded man sitting at the left with his hands on his knees. He is leaning forward slightly as though he is trying to comprehend what Jesus is saying; responses to his questions bring further questions from him. Jesus is sitting across from him on a parapet a few feet away. His eyes are fixed on Nicodemus as he gestures while he speaks. Tanner’s painting gives us a sense that we are witnessing this meeting. 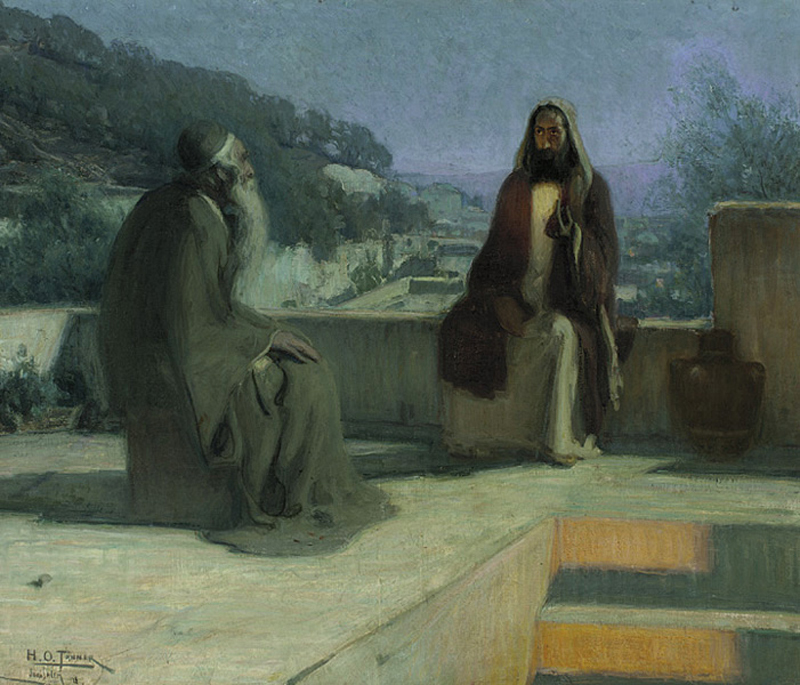 Unlike Medieval times when a biblical event was often given a local setting, Tanner’s setting is in the Near East as it might have been in the time of Jesus; turn of the century Paris is not the setting for this painting.